Medina – MN The Good Samaritan Council 13096 will once again their annual Free Throw Championship on January 28, 2017 at 2pm which is an updated time from the previously announced. 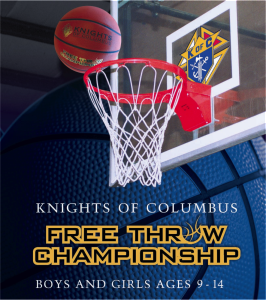 All boys and girls ages 9 to 14 are invited to participate in the local level of competition for the 2017 Knights of Columbus Free Throw Championship. The local competition will be held January 28th, at 1:30PM in the Gym at Holy Name of Jesus Catholic Church which is located on County 24 one mile west of State Highway 101. They will also be helping with the district tournament on Feb 11th from 1:30 – 3:30pm which the location for was still to be determined. Since 1972, councils have sponsored the annual Knights of Columbus International Free Throw Championship for boys and girls between the ages of 9 and 14 (starting in the fraternal year 2013-2014) with winners progressing through local, district, and state competitions. International champions are announced by the K of C international headquarters based on scores from the state-level competitions. All boys and girls 9 to 14 years old are eligible to participate and will compete in their respective age divisions. All contestants on the local level are recognized for their participation in the event. Age eligibility is determined by the age of the contestant on January 1st, 2016. Parental/guardian consent is required. Download your entry forms or contact Earl Forrence for additional information. If you wish to volunteer at the event please sign up now! Watch a Video of Bishop Barres of Allentown, Penn. commenting on the Free Throw Championships.